Nearly all trace of the non-denomination church that once met on the "Yelm Prairie" has been lost. It seem to have been the same congregation that met in a log cabin schoolhouse east of Yelm and across from the present Seventh Day Adventist Church. This church was meeting in the early 1860s. James and Virinda Longmire had brought their family from Indiana in 1853. James was captain of the first wagon train to cross the Cascades through Naches Pass. and served in the Territorial Legislature in 1857-59. "James Longmire directed the lowering of wagons over the sheer cliff near the summit of Naches Pass in the Cascades in late l853. They needed to kill three of the poorest steers to have enough hides to cut and make ropes to lower the wagons. It took two days to lower the 36 wagons down to the base of the summit and only two wagons were wrecked." "My arrival In this country, Oregon, with torn and ragged pants and coat, my cap tattered and torn, and with one boot on, the other foot covered with an improvised moccasin made of a piece of cowhide from one of the animals we had killed . . . . In this garb I was to meet a party of well dressed gentlemen from Olympia . . . . My dress was a fair sample of that of the rest of our party, and when together, we felt pretty well, all being in the same fashion; but when brought face to face with well dressed men I must confess I felt somewhat embarrassed." Longmire discovered Longmire Springs in 1883 and built the first wagon road to Mount Rainier in 1884. The story is given in detail at another site. 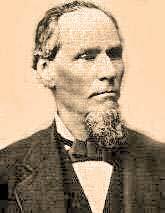 Mr. Longmire helped to establish a congregation on Yelm Prairie, and he and Tyrus Himes served as deacons together. Tyrus and Emeline Himes had been in the same wagon train. Thomas Taylor was the preaching elder for this congregation on "Yelm Prairie." James Longmire and John Albert are buried in the Yelm Cemetery beside numerous descendents. Tyrus Himes died in 1879 and is buried in the Odd Fellows Cemetery in Tumwater. Originally named Seatco, three men met to pick a different town name. They were William BUckley, Samuel COulter and J. B. DAvis. By combining their own names, the name of BUCODA emerged. With so many coming to Bucoda from Kentucky and Tennessee, it is likely that families with previous connection to the Christian Church settled here. Although religious services were held as early as 1879 at the Seatco prison, organized religious services did not begin in Seatco until 1889. . . . . The Episcopal and Christian Churches were organized that same year and conducted services in private homes. We know that aged Thomas Taylor, an early circuit-riding preacher in the Puget Sound area, lived in then tiny Tenino in 1885. (Tenino eventually became the larger town.) The 92-year-old Taylor probably included Bucoda in his circuit, although he died before 1889. If the Christian Church was organized that year, private services were probably held much earlier and Thomas Taylor would have been a part. 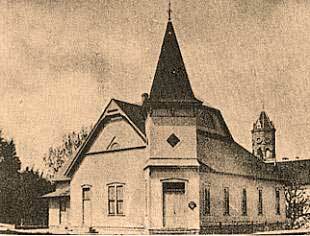 Disciple historian Orval D. Peterson listed the Bucoda Church in his 1897 list of active congregations. Among the first representing simple New Testament Christianity in Olympia were Alfred Ridgley and Martha Elder. They had first settled in Yamhill County, Oregon and then in 1862 they moved to Olympia. They had crossed the plains in 1849. Their daughter, Maria Jane, was the wife of Sanford Watson of Bethel, Oregon. Another daughter, Mary Elizabeth, was married to A. S. Watt of Lafayette, Oregon. One writer says of Elder that he was a Kentuckian by birth and training. "Mr. Elder was long and favorably known as an Indian agent on the Sound, and also preached at intervals, being a member of the Christian church. " Historian Jerry Rushford believes the church began in the 1860s and later died out. The church gives 1890 as its beginning date. Creative John Pray moved to Olympia and searched for a church of the simple New Testament order. Finding none, he inquired at the post office about who was receiving the Christian Standard. Calling on them, he located a web of friends wanting to establish a church. They began meeting and the next year located Jacob Eshelman attending the legislative session in this state capital city. At that time, Mr. Eshelman was minister of the North Yakima Christian Church. About 39 members were organized in 1891 with the help of Senator Eshelman. Eugene Sanderson was also involved in the weekly services. This was before he launched the Eugene Bible University. There is a profile and photo of Eugene Sanderson. 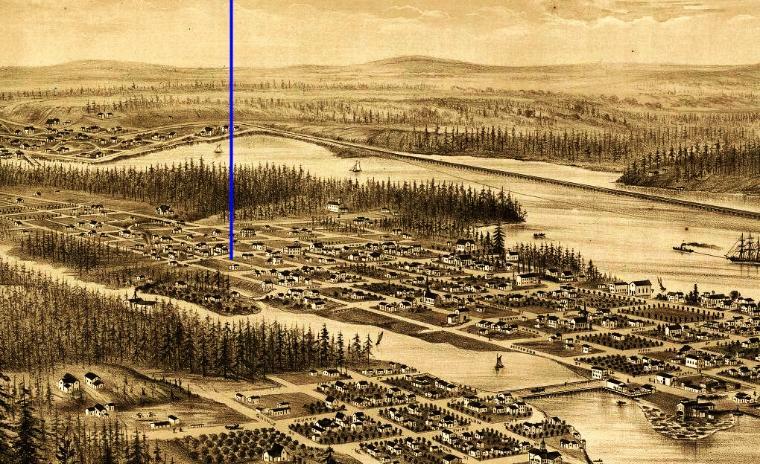 The location of the first building can be seen on a bird's eye view of Olympia. Then James S. McCallum came that same year. He was still there at the end of 1894. John Hedges was the first convert and was baptized in the Deschutes River. building had been moved and expanded. The church first met in Columbia Hall on 4th between Washington and Franklin. The next meeting place was the old Washington School at 5th and Eastside Street. Following this move, a lot was leased at the corner of Adams and Union Streets and a church building and parsonage were erected. This building was 34' x 64'. The building was dedicated by William F. Cowden on November 22, 1891. The immediate growth led to two hundred members and the building and parsonage were moved to Franklin and 8th in 1895. The building, just a block or two from the then new State Capitol, was remodeled and enlarged. This one is pictured here. Our source for much of the above information and the photo of the building is drawn from the well-researched booklet 100 Years of Christian Witness: A History of the First Christian Church, Olympia, Washington by Jim Lawson. The booklet is available at the Washington State Library in Olympia and may be available from the Church office.